Back in April I received a very exciting invitation from my lovely friend and creator of The Clandestine Cake Club, Lynn Hill. She was asking if I was free to simply pop up to Leeds for the day, bake a cake and join her and some fellow cake-loving comrades at a top secret location for some fun with a television crew. This wasn’t just any crew either, as lovely as they all were, they were actually following the legendary chef, Nigel Slater around the UK in search of facts, history and stories based around our favourite topic; cake. 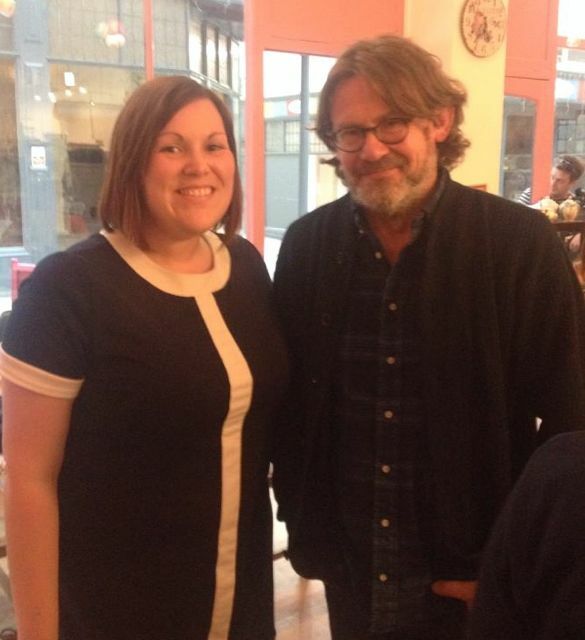 Nigel Slater was making a new BBC 4 TV documentary, in a similar format to his previous features on is favourite childhood sweets and the nations’ favourite biscuits. He was on a road trip to find out why we love cake so much with the UK and what has been on offer to us over the years. 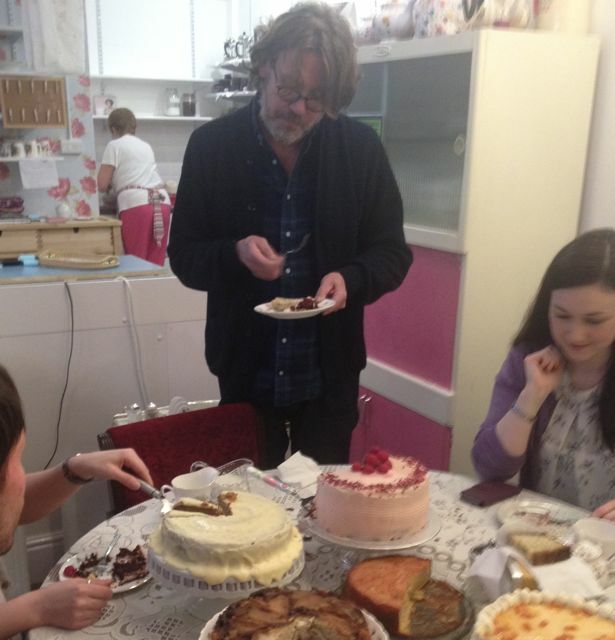 The Clandestine Cake Club were asked to meet at Just Grand vintage tearoom in Leeds one windy afternoon and a handful of us met up earlier than planned for a cuppa and some “oohing” over each other’s creations for Nigel to try – yes, we really are that geeky. 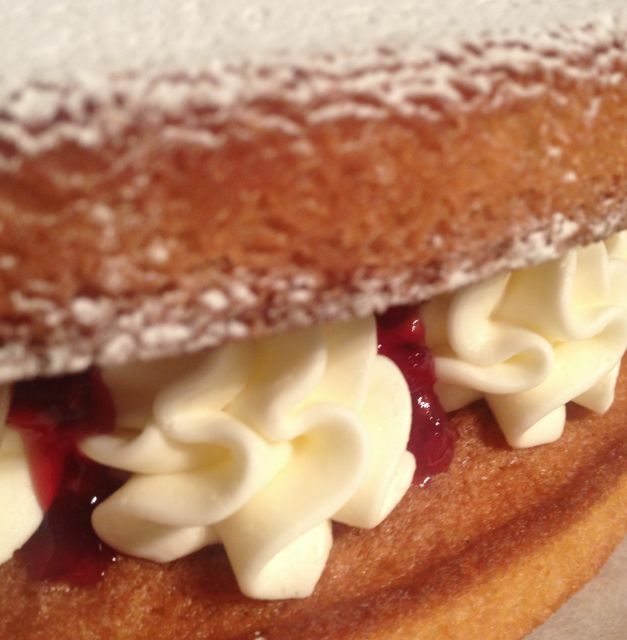 I made a classic Victoria Sponge with homemade raspberry jam, with my more modern twist on the buttercream with some spirals (truly hoping that Nigel wasn’t too much of a traditionalist when it came to a wedge of classic sponge cake!) in the middle. Whilst preparing to dust my cake, I also decided to write the title of the show (“Icing on The Cake”) on top of the cake with template letters before dusting over it. The crew loved it and Nigel appreciated it too, so I was thrilled it went down as well as it did. 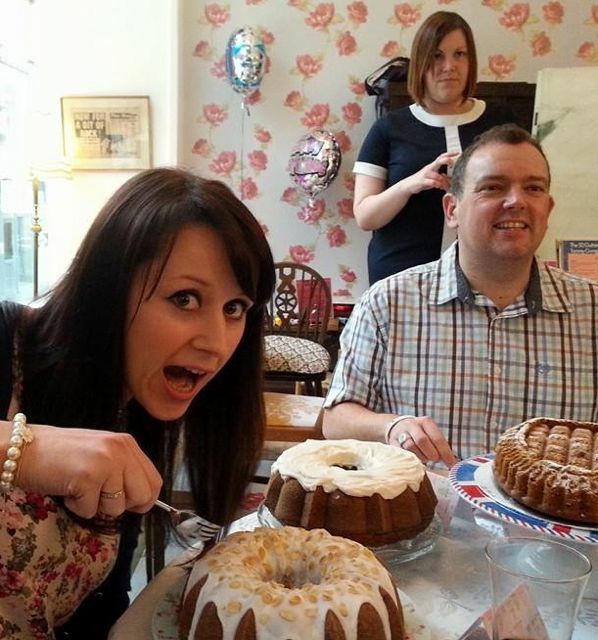 My cake was by far one of the most traditional as Lynn had made a beautiful coffee & meringue cake which was divine and we had the queen of Bundt Cakes (Rachel at Dolly Bakes) to provide the table with one of her trademark Bundts using a shaped tin from Nordic Ware. The event itself was a very special version of a classic Clandestine Cake Club meet (if you haven’t got a clue what this actually involves, why ever not?!) 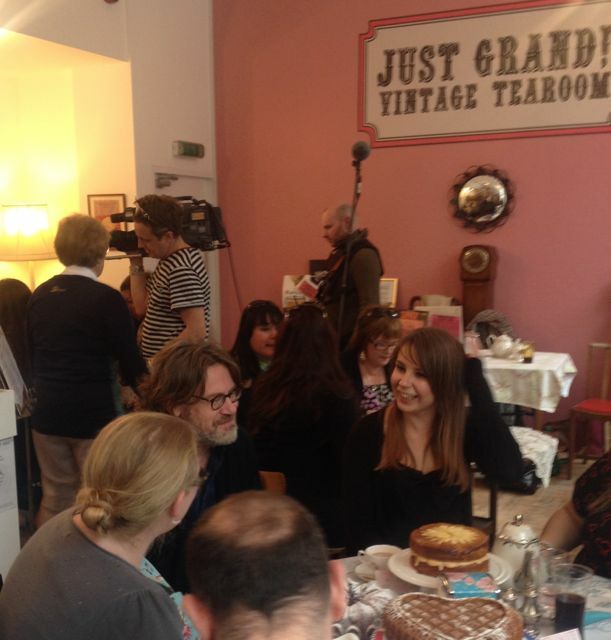 with Nigel joining us all at each table to chat on camera about why we love cake and what it can bring to the nations’ lives. 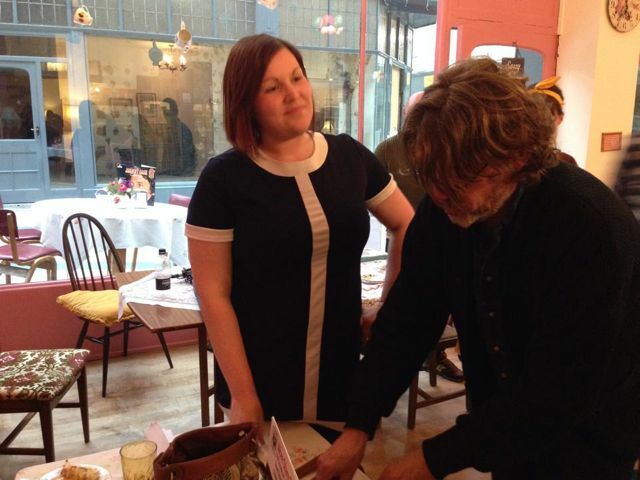 Whilst he was sat with myself and my lovely friends at my table, we discussed how baking brought back happy memories of baking with our families and how groups such as the CCC brings people together socially. It was a fantastic day, Nigel and his team stayed with us for the best part of 3 hours that afternoon, chatting and eating cake on (and off!) screen and Nigel had even made us all a coffee & walnut cake to tuck into – what a gem he was, it was lovely, of course! 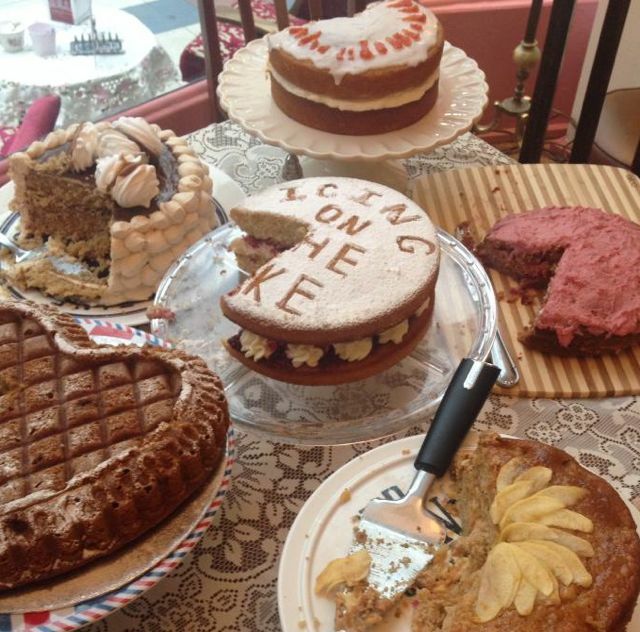 Lynn works very hard to create a platform for people to host a club to meet new people and bring them together over tea & cake. 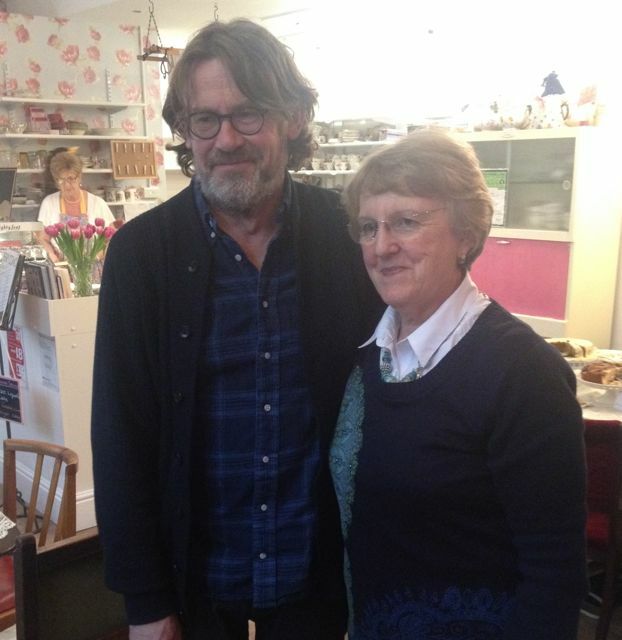 I see the hard work it takes, so to have Nigel Slater joining as an honorary member (especially when he enters into the spirit and bakes a cake following the CCC rules!) is well deserved. I’m proud to be a part of this cake club myself, having founded and organised the Cambridge CCC for years until very recently. We were the second CCC to open after Leeds back in the day and with almost 200 clubs worldwide currently, I’m super proud to have been a part of this cakey history. Even though I no longer run the Cambridge club, I still frequent others across the country on my travels when I can and I’ve made some super friends as a result – some of us even met up in Leeds a few months back for a special afternoon tea with Bettys of Harrogate. I adore the CCC and everyone connected to it, it’s such a friendly community. 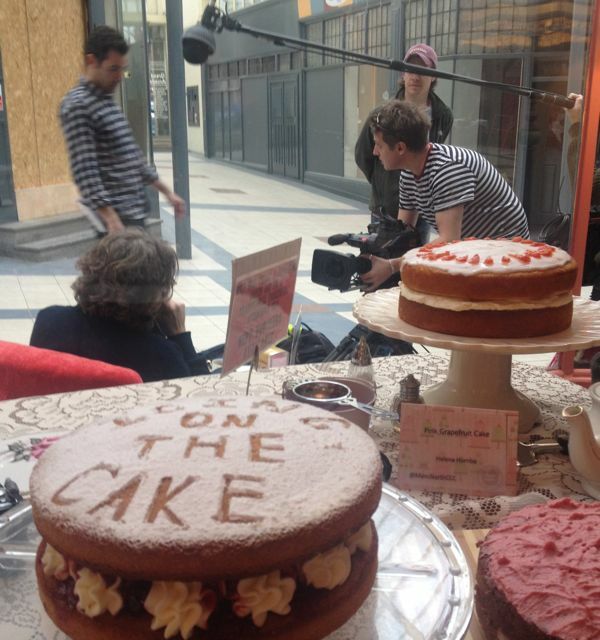 The documentary itself aired on BBC4 last Thursday and I make a very brief appearance myself towards the very start of the show…as well as my cake too. You can watch this show back on BBC Iplayer by clicking here. 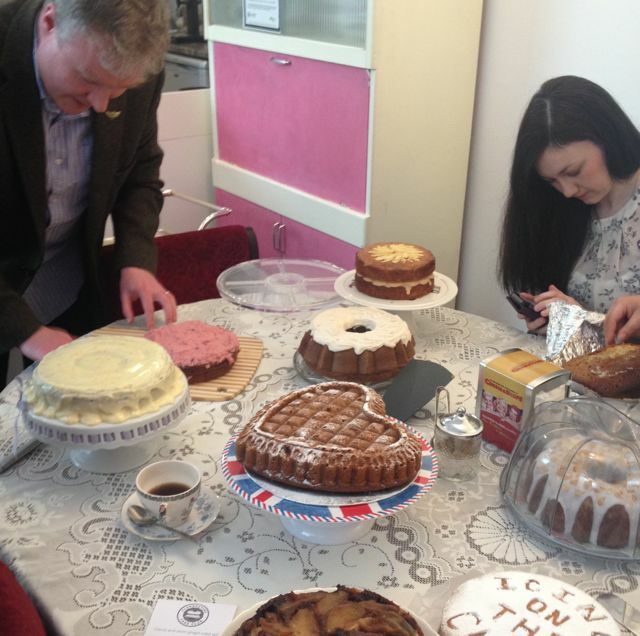 The Clandestine Cake Club is also looking for advertisers and sponsors for their website, so take a look around and contact Lynn if you’d like to get involved somehow – this brand has exciting plans for 2015 and beyond, including a second cookbook, so you’ll want to be a part of it if your business fits the brand!